"Orli is a better surfer. At least he didn't get a black eye surfing down those Helm's Deep Stairs." Hmmm. So you surf TOWARDS the beach. "I guess Arwen didn't believe me when I told her Eowyn and I are 'just friends�!" "Those Haradrim lifeguards are TOUGH - when they say 'no surfboards', then mean no surfboards!!" 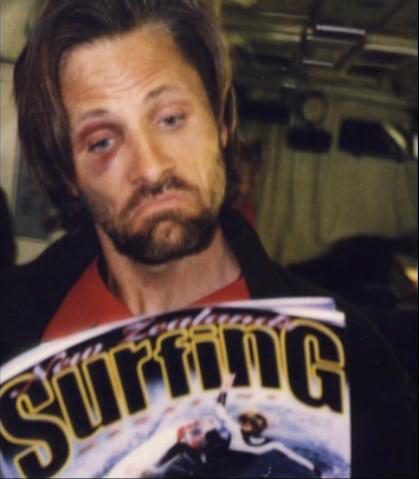 Viggo: Next time I am going to read this Surfing manual before I get on the surfboard. Billy kept yelling "hang 10," and I thought he was saying "bang head." "Hmmm. Compared to surfing, falling off a cliff isn't so bad."